He’s a real catbird (related to sitting in the catbird seat): A term that originated in the South in the 19th Century; popularized nationally by Brooklyn Dodgers baseball announcer Red Barber (1908-1992) and later by humorist James Thurber… Refers to someone who’s in an advantageous position, like those little gray male catbirds that build fancy perches high in the trees to see better while appealing to the females. Mardi Gras is over. Like that fellow still hanging out on Bourbon Street on Ash Wednesday, the Old Bride could do with a bit of a cleanse during the 40 days of Lent. It’s time to lighten up, both literally and metaphorically, by making simpler foods on a tighter budget. That’s why this week’s recipes feature gelatin. 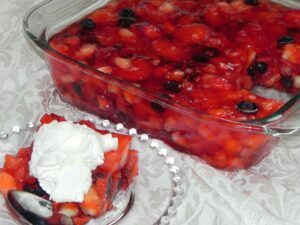 Our mothers and grandmothers were masters of this genre, whose many iterations were known as “congealed salad.” Men refer to these gelatin salads as “lady food.” The genre may have fallen out of fashion, but during the mid-20th century, all successful food gatherings included at least two or three gelatin salads. Technically, he was incorrect. Gelatin used to be made from calves feet, not horses’ hooves. The substance is a food protein consisting of partially hydrolyzed collagen, extracted by boiling animal bones and hides. In 1682, Frenchman Demnis Papin (1647-1712) recorded his experiments to remove the glutinous material from boiled animal bones. He discovered that the gelatine was odorless, tasteless, and colorless, but also was a pure protein. Napolean’s troops were the first to use it as a nutritional supplement. The J & G Company of Edinburgh, Scotland developed unflavored dried gelatin for food use in 1842, and began exporting its Cox’s Gelatin to the United States. Peter Cooper (1791-1883) secured a U.S. patent in 1845 for a powdered version of dried gelatin to use in desserts. An industrialist and inventor who had produced the first steam locomotive in America, Cooper owned a glue factory, and gelatine byproducts were already being used for making glue. The Waits lacked the resources for proper marketing, and in 1899, sold the Jell-O formula to their neighbor, Orator Francis Woodward for $450. Woodward began marketing the cheap and easy food by sending out salesmen in fancy carriages to fairs, church socials and other gatherings, where they shared samples of Jell-O. The original flavors were strawberry, grass (! ), orange, and lemon. The product caught on, and Woodward’s Genesee Pure Food Company became a success. The company name was changed to Jell-O Company in 1923 and merged with Postum Cereal, Inc., in 1925. The company later became General Foods Corporation. During the same period, others were experimenting with gelatine. In 1874, a British maker of marmalades, jams and jellies (Hartleys) began incorporating gelatin into its jelly and jam. And although Peter Cooper held the U.S. patent for gelatin, Charles Knox developed his own version. He created the first pre-granulated gelatin in 1894 after observing his wife’s difficulty of making gelatine for household cooking use. Knox developed a process for producing dried sheets of gelatin to which hot water could be added for making aspics, molds and desserts. Knox hired salesman to sell his “Sparkling Granulated Calves Foot Gelatine” door-to-door. His wife, Rose, published the first known cookbook dedicated to gelatin. Over the years, cooks developed recipes for entire menus composed of gelatin-based foods, ranging from the sweet to the savory. Gelatin sales exploded once entertainer Jack Benny began promoting Jell-O on his radio program in 1934. Gelatin sales began to decline around 1974, which is when the Jell-O brand hired entertainer Bill Cosby and began selling molded gelatin snacks (jigglers). The gelatin shot (Jell-O Shots, vodka jelly, or jelly shot) became popular during the wild and crazy 1970s. This alcoholic nightmare was rumored to be a 1950s invention by desperate National Security Advisors employees stuck on a military base. However, the first published recipe for a gelatin shot was in an 1862 mixology cookbook by Jerry Thomas, titled How to Mix Drinks, or The Bon Vivant’s Companion. The original recipe called for gelatin mixed with cognac, rum and lemon juice. Gelatin is used in many products ranging from cosmetics to vaccines and pharmaceuticals. Certain fresh fruits prevent gelatin from setting properly. They contain protease (protein cutting enzymes) that will change the gelatin molecules into peptides, which are protein fragments too small to form a firm gel. That’s why recipes for gelatin fruit salads always caution the cook to use canned versions of pineapple, kiwi, papaya, or figs because the canning (cooking) deactivates the offending proteases. Dry gelatin powder has an indefinite shelf life if stored in clean, dry, well ventilated conditions, which appeals to the Church of the Latter Day Saints (Mormons), who practice food storage for long-range planning purposes. Gelatin solutions cannot be frozen. Gelatin is susceptible to bacteria contamination, and must be maintained in a hygienic environment. Use or lose your leftover gelatin salad by about day 4. Although an incomplete protein without biological value on its own, gelatin is high in lysine, an essential amino acid. Gelatin is considered a fine supplement to enhance the protein nutritional value of foods such as bread. Gelatin supplements have been proven to promote hair and nail growth and strength, and to alleviate the pain and inflammation caused by arthritis. Allergic reactions to gelatin are virtually unknown. A 3-ounce package of dried gelatin makes up 2 cups, and a 6-ounce package makes up 4 cups before addition of fruits and veggies. To make a single serving of gelatin, add a half-cup of boiling water to 1-3/4 tablespoons of powdered gelatin. When doubling a gelatin recipe, only use 1-1/2 times the salt, vinegar, and lemon juice. Always chill your mold in the fridge before adding the gelatin. Whenever adding fruits and veggies, partially set the gelatin until thick before adding to prevent them from sinking. Refrigerate the gelatin for at least 4 hours or overnight until firm. It should not feel sticky on top and should not sag if tilted. To unmold gelatin once set, dip a small pointed knife in warm water (wipe dry) and run the tip around the top edge of the mold to loosen the sides. Submerge the mold almost to the rim in warm water for about 10 seconds (longer will melt the gelatin). Hold the mold against a large plate or platter and quickly flip. Thump the bottom of the mold and wait a few seconds for gelatin to drop onto the plate. Tomato aspic is totally chick food. Its peculiar flavor blends well with cottage cheese and salads. My recipe is a variation of numerous versions, some with and some without added veggies, some with only unflavored gelatin, and some with plain tomato juice. NOTE: Canned tomato juice and V8 Juice contain high percentages of sodium. Try experimenting with additions such as green onion, chopped olives and artichoke hearts. Substitute fresh lemon juice and a third package of unflavored gelatin for the sweet lemon gelatin. Spray 8-inch square dish, single large mold, or 6 individual molds with nonstick cooking spray (I used a mini-bundt cake pan). Dissolve unflavored gelatin in the cold water. Heat V-8; add bay leaf and the unflavored gelatin. Bring to a boil, stirring. Remove from heat, remove bay leaf. Stir lemon gelatin into hot mixture until dissolved. Stir in remaining ingredients until completely mixed. Pour into square dish, large mold, or individual molds. Loosely cover with waxed paper that has been oiled with nonstick cooking spray. Chill 4 hours, until completely firm. Unmold by placing gelatin mold in shallow pan of warm water for about 10 seconds. Run a sharp knife carefully around the edges to loosen from the sides. Flip onto a lightly oiled serving dish (to prevent sticking and make it easier to reposition). Garnish with lettuce leaves and cottage cheese or mayonnaise (or both). Combine water, vinegar and sugar in a medium saucepan and bring to a boil. Add the raspberry-flavored gelatin and stir until dissolved. Remove from heat. While raspberry gelatin mixture is cooling, combine the tomato soup and unflavored gelatin in a mixing bowl. Add remaining ingredients; mix well. Pour raspberry gelatin into the veggie mixture and stir with large spatula or wooden spoon until completely blended. Spread into oiled decorative mold or 8-inch square dish. Refrigerate overnight. Unmold by immersing bottom in pan of warm water for a minute; wipe bottom of mold to remove all water, and turn out onto a plate lined with lettuce or spinach leaves. Serve with dollops of mayonnaise or sour cream. It’s a terrific complement to a fish entrée. YIELD: 6-8 servings. 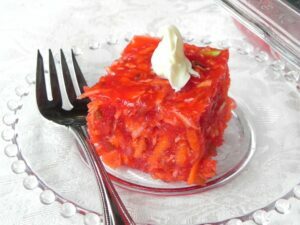 VARIATION: Substitute lime gelatin for the raspberry, and whip the partially set gelatin with mayonnaise, cottage cheese, or cream cheese. This is an excellent substitute for dessert and a good use for leftover bits of fresh fruit (remember the no-no’s of papaya, kiwi, fig, and pineapple). The cook can be as creative as the pantry and fridge allow. Feel free to mix whipped cream into the gelatin along with chopped nuts. Another version calls for orange gelatin with canned mandarin orange slices substituted for the strawberries. Whenever I add fruit to gelatin, I prepare the gelatin with the quick-set method because it requires less water, which offsets moisture in the fruit. Prepare a large mold or 8-inch square dish by oiling with nonstick cooking spray. Bring 1-1/2 c water to a boil and pour over the two packages of gelatin in a large mixing bowl. Stir until gelatin dissolves. Add the 2-1/2 c of water and ice, stirring until gelatin begins to thicken (you will notice the liquid thickening on the bottom when stirring). Remove unmelted ice. Place gelatin in fridge for 30 minutes. Combine the fruit, tossing gently to prevent breakage. Cut up bananas at the last minute and refrigerate mixed fruit until the gelatin has begun to set. Fold the mixed fruit into the partially set gelatin and turn out into the oiled dish or mold. Refrigerate overnight. When ready to serve, cut into squares or unmold onto a serving platter and garnish with whipped cream or whipped topping. YIELD: About 6-8 servings.